In the wee hours of the morning we woke and heard the familiar sound of rain on the roof of the camper and cringed!! Drat ... !! We are supposed to go kayaking in a few hours ... then the wind blew up ... double drat!! Luckily, by the time we had to check in at the office for our trip at 8:30am, the sun was shining and the wind had died down substantially ... yay!! Once we had the formalities out of the way, we met our guide for the day ... Wade, who sorted us out with dry bags, and a pelican case for our valuables, as well as briefing us on the trip ahead - Tonga Island Seals. We were to be a group of 3, however Rolf and I were the only ones to show up and therefore we had Wade to ourselves for basically the whole day (at least the kayaking portion of the trip)! 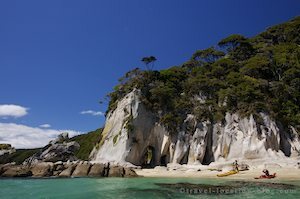 Wade has had more than 5 years experience guiding in the coastal waters of the Abel Tasman and knows the area like the back of his hand, as well as its history. Before departing, we donned our bathing suits, splash jackets, and life vests and boarded the water taxi (which incidentally was still on dry land on its trailer and hitched to a tractor). Our excursion with Abel Tasman Kayaks departed from their office in Marahau, and we set off on the short ride to the boat launch. We were launching at low tide so the tractor had to tow us out to the seaward side of the sand bar which is completely out of the water at low tide. The tractor backs down into the water then with a sudden jolt we are launched into the pristine waters of Tasman Bay. Our first stop, a slight deviation from the regular route, is Split Apple Rock, a formation a short distance from Marahau which sits out in a bay - and it looks just like a split apple. There are several Pied Shags resting on the rocks, while preening themselves. We cannot spend to long here since we are on a scheduled water taxi run so we head off to Tonga Island to check out the New Zealand Fur Seal colony. Landing is prohibited on the island since it is an important breeding ground for the seals. We are lucky to see several newborn seals sitting high up on rocks. Soon we are speeding towards the golden sands of Onetahuti Bay - the starting out point for the kayaking portion of our trip. As soon as we reached the beach and unloaded our kayaks from the water taxi, Wade gave a briefing on how to operate a kayak including the procedure in the event of a capsize. Since we were all eager to start paddling we pushed off from the shore shortly after the briefing, into the cool turquoise waters. The rocky foreshore is made up of a soft granite which is easily eroded and shaped by the water and wind. The constant wave action rubs particles of granite off and this is what gives the area the beautiful golden sandy beaches. The sand on the sea floor, which is also made up of the particles eroded away, reflects the sunlight and gives the water the turquoise appearance. There are many geological intrigues as we paddle our way along the coastline such as arches at Arch Point and numerous caves that dot the shores. We pass by another New Zealand Fur Seal Colony on Pinnacle Rock, where a flock of Rock Shags are also hanging out.